I always like getting something for free. Hell, if I knew I could get away with it, I wouldn't pay for anything. This mentality is one of the reasons that the Bajorans are my absolute favorite Second Edition (2E) affiliation. One of today's spoilers for the newest 2E set, Hard Time, has free written all over it. In fact, I'm not entirely sure why the designers decided to put a printed cost on Brin at all. Sure, sure he 'costs 2'. I'm sure that will be relevant at some point in some game in the future. Not a game that I'll be playing in, but some game perhaps. Well, putting more thought into it -> he likely costs 2 just so that Basso Tromac can't abuse him. He could list a cost of N or even 100,000 and it would be just as relevant - cuz I ain't paying it. The trick is that sweet, sweet gametext. Old Brin says I can have him for free just by having him in my hand and removing a card in my discard pile from the game (he's really into RFG). It could even be my opponent who removed the card from the discard pile, say with Greasy Dukat, and he'd leap right into play. So what all are we getting for the most acceptable price of nada mas. Brin has five skills, none of which are particularly common for Bajorans. 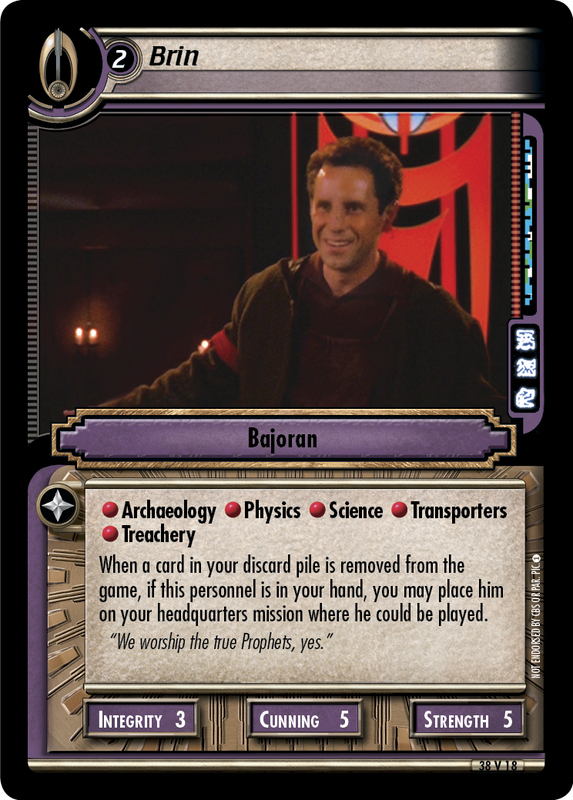 I once played a Bajoran deck with no Science at all (by mistake); Physics and Transporters are neither the most common or the most rare, but always useful; and as for Archaeology: I've heard tell it's going to be more necessary in the coming months. That just leaves Treachery, which isn't a particularly good skill to have but makes sense given that he's perfectly okay with me stealing from the store. Unlike the skills, though, the attributes are quite pathetic. If he wasn't such a bargain I might not even bother. A fiver for each Cunning and Strength is pretty bland and that Integrity is just pathetic. But then, it is rather clear that this personnel is not intended for the traditional Integrity based Bajoran build, but rather the antithesis thereof. So the next question is, what to use to get this RFG done. I did a search and there is an endless supply of choices. In fact, it won't be necessary at all to include a card in the deck to do this - it should already be there. The most obvious choices are the mid-mission cheater cards that come standard in a Treachery based Bajoran build. Interrupt cheaters such as Dark Secrets and Covenant as well as personnel cheaters like Basso Tromac, Anjohl, Jaro Essa, Vaatrik Pallra, and even Hero Kira. Though I'm not sure why you'd even wait until you're able to attempt a mission before cheating Brin into play. After all, he'd be much better suited as dilemma fodder in said mission attempt. Many personnel would allow this RFG to happen as an added bonus onto something you intended to do already, such as: downloading a personnel, getting free draws, getting free counters, getting back slightly used dilemmas, or just hauling off and stabbing some random passerby. But even these seem excessive. Sure, if they are already in the deck, why not get a bonus for what you already intend to do. However, even the most utilitarian of Bajoran cards can get you and RFG. Take for instance In the Pah Wraith's Wake (event destruction), Ancient Grudge (event counter), and Bajoran Gratitude Festival (card draws). These are the nuts and bolts of a good Bajoran deck. And finally, you can get Brin for free while never putting any such cards in your deck. Rapid "Progress" is a quite popular dilemma which design just gave you another reason to stock.